For many years Genlias, the Dutch BMD database, was the place to go to start your Dutch research. 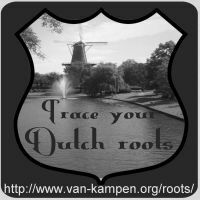 I have often talked about or recommended Genlias, here on Trace your Dutch roots (a search for Genlias on this website gives over 300 results). However, the technology behind Genlias is outdated and not maintained anymore. On 2 July a new website opened its doors: wiewaswie.nl. This website is the successor of Genlias. "On July 2 this year, a beta version of the website WieWasWie went live. Genlias will be available as usual until November 1, 2012." As I write this, wiewaswie.nl is still in beta, and it does not have an English interface yet. I do not know when that will change. It does have some extras that Genlias does not have, like the ability to view and download scans (at the moment only for a small part of the records). This will be a paid feature, but is free until the end of the year. I will soon write another article about wiewaswie.nl. If you have any questions that you want me to cover, please leave a comment below. If you have questions about wiewaswie.nl, ask them in the comments section below and I will try to cover them in a future article. If you must use Genlias for anything, do it now (or at least before the end of the month). Download the scans you may need from wiewaswie.nl before the end of the year (while it is still free). I will miss the search options to use two people at Genlias. Very handy for common names. I'd like a better idea of what the difference in the basic and premium subscription levels is. Thanks for your feedback! The option to search for two names is planned for 1 November. I'll have a look at your other concerns and answer them in another blog post soon. Yes, they did. They're behind schedule moving records from Genlias to WieWasWie. I'll publish another blog post soon. I don't speak Dutch. Will there be an English version soon? Does anyone no the status? I can't continue searching my mom's side of the family! I won't be able to do that any more. Not happy! I have had great success using wiewaswie in the last few weeks. The advanced search, where you can enter two names or even just initials, is great. However, for the last 4 days, I can't view any records. The search function still operates, but I can't open any individual records. Is anyone else experiencing this? I don't have a problem, Jen. But I was away, with limited internet, when you asked your question, so I don't know if there have been any issues. It is working fine for me now.